The latest fad to get the marketing push from wireless network manufacturers is dual-band. While we wait for the 802.11n specification to make it over a few more legal hurdles and get ratified, the manufacturers are pushing a feature that has been a specification since day one, and now we have the Linksys WRT320N. The manufacturers seem to forget that 802.11n has always been specified to operate at 2.4GHz and 5GHz, although for cost reasons the first glut of consumer devices focused on 2.4GHz, while businesses enjoyed 5GHz. The WRT320N operates at both frequencies, and can improve performance because of this. There is a crucial caveat with the dual-band on offer, though. The WRT320N doesn't operate on both bands simultaneously, so you have to define which you want your network to use. 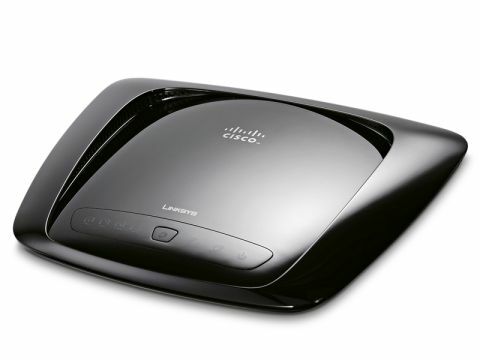 If you're looking to build a network using both frequencies, Cisco's WRT400N is the router for you. The WRT320N does support fast-wired connections, though, offering up four gigabit Ethernet ports – great if your network is wired. Thanks to Cisco's wizard, configuring the router is straightforward. Also, we were able to use our iBook in the garden, and the powerline extender in the spare room wasn't needed. We saw throughput go from 2.8MB/sec to 3.8MB/ sec at reasonable range, although this isn't outside of what's expected from routers. It does the job and doesn't cost over the odds either. Shame Cisco doesn't produce a Mac compatible dual-band adaptor, though.